In this post we give you some ideas of how to reduce your risk of being involved in a road accident. At Stonehewer Moss we specialise in accident and injury compensation claims. We fight to secure compensation to cover our clients suffering and injuries which resulted from someone else’s negligence. However no amount of compensation can take away the pain, repair a long term injury or fully restore someone’s confidence after an accident. All too often the accidents we hear about are caused by negligence or ignorance of basic accident prevention measures. In this blog as well as keeping you informed of our company news we want to promote accident awareness in Cheshire and in doing so contribute to accident prevention. Great Britain has one of the best road safety records the world. Despite massive increases in traffic over the last few decades, the number of people killed on our roads has fallen from around 5,500 per year in the mid 1980s to well under 1,754 in 2012. However, this still means that five people die on Britain’s roads every day. Around 400 people a year are killed in crashes in which someone exceeds the speed limit or drives too fast for the conditions. Around 280 people die a year in crashes in which someone was over the legal drink drive limit. Around 200 lives each year could be saved if everyone always wore their seat belt. More than 300 deaths a year involve someone being “careless, reckless or in a hurry”, and a further 120 involve “aggressive driving”. Around one third of fatal and serious road crashes involve someone who was at work. More than 400 people are killed in crashes involving young car drivers aged 17 to 24 years, every year, including over 150 young drivers, 90 passengers and more than 170 other road users. As regular road users in Cheshire we are all exposed to the significant risk of a road accident, it is one of the largest risk that we face in our daily life. If we cycle or walk or travel by motor bike on busy routes then the risk is even higher. 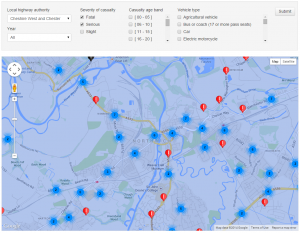 To help us understand the risks the department of transport has developed a website to enable you to compare the accidents in your area and asses the performance of you local authority in managing road safety. 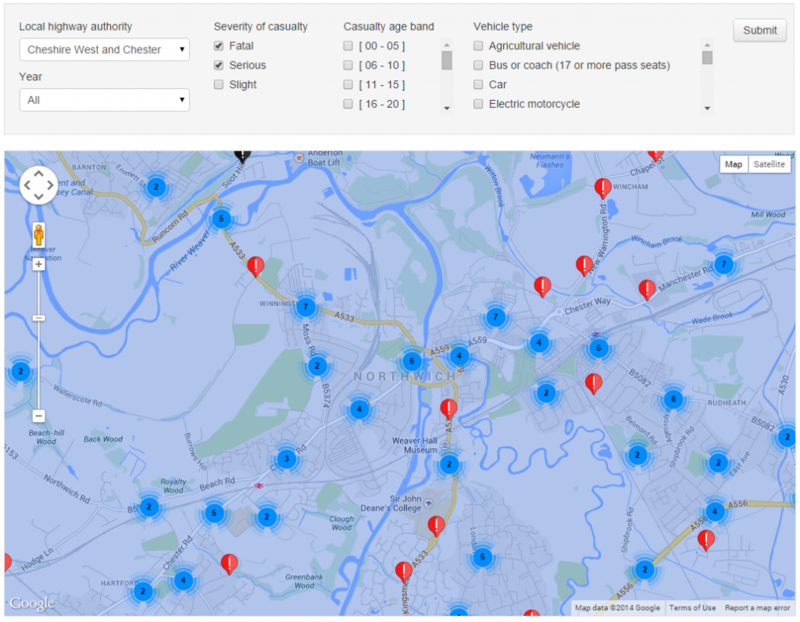 This enables you to find your local area and see where accidents have occurred. This can help you in plan a safer route to school or work. At a time when local authority spending on road safety has been cut by over 10 fold across Cheshire it is more important that every for us to be accident aware and to consider how we can make our local roads safer. I hope this post have given you some ideas on how to stay safe on our roads, but however careful you are you may still be involved in an accident that is not your fault. Remember we at Stonehewer Moss Solicitors are here to help should you be injured and it is not your fault. This article was added on Tuesday, September 16th, 2014 at 4:39 pm and is categorised under General News, Traffic Accidents. Both comments and pings are currently closed. Error: Error validating access token: Session has expired on Saturday, 09-Mar-19 13:12:58 PST. The current time is Thursday, 25-Apr-19 05:52:38 PDT.